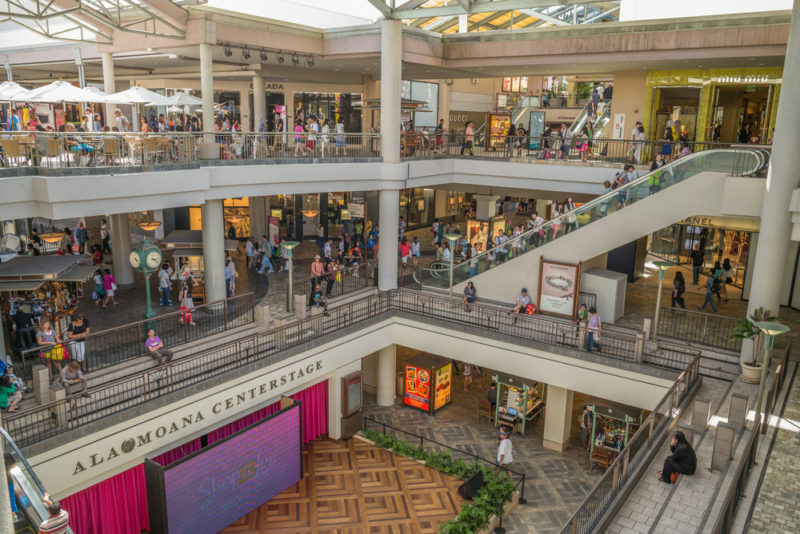 Ala Moana Center is always hopping with the latest trends and overflowing with fashion, technology, food, artwork, events, performances and that gorgeous Hawaiian weather! The mall is designed with an open-air concept that includes fishponds, sunny walkways, hip restaurants and even grassy lawns where you’re welcome to sit and take a break in between stores. And shoppers aren’t the only ones who will enjoy Ala Moana Center. There are plenty of specialty shops, attractions and bits of Hawaiian culture hidden throughout the mall that will keep anyone busy! Definitely reserve most of the day for exploring Hawaii’s largest shopping center. Walking the grounds and window shopping every inch of Ala Moana Center will take you 3 – 4 hours at the very least – and that isn’t even counting actual shopping (and eating) time. Wishing you a full wallet! Besides Shopping, What Else Can You Do? There is something for everyone at Ala Moana Center. I promise. Kids will be enraptured at the koi ponds (Japanese carp) and there’s always something happening at Centerstage. Food is also a HUGE part of Ala Moana Center’s culinary offerings – make sure you eat here at least once! 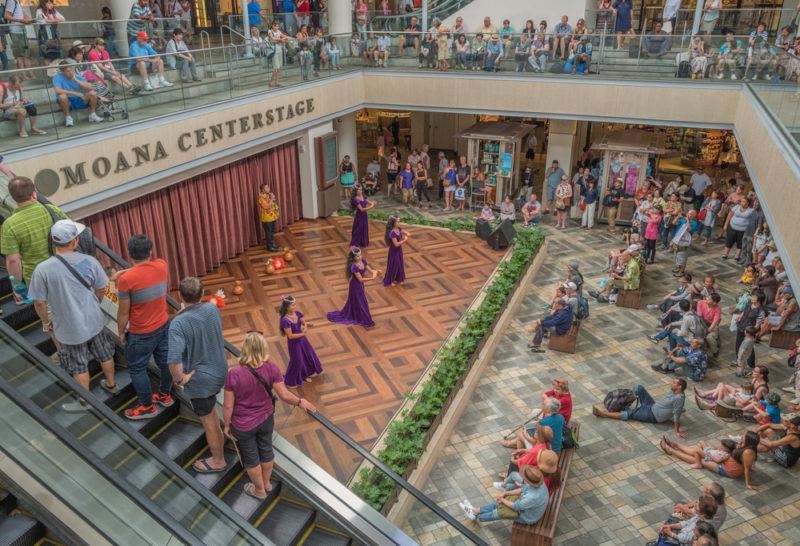 Centerstage – Everyday, Ala Moana Center has a fun hula performance that’s free and entertaining. A variety of Polynesian dances, instruments and even lovely vocals will please the eyes and ears in the very middle of this shopping plaza. Centerstage is also where traveling performers and artists show off their talents so if your performing arts group is coming to Hawaii, the stage is yours! Food and drinks – Local food is what drives many of my travels and Ala Moana Center does not disappoint! There are a TON of options here to choose from ranging from the normally-priced food court to crazy-expensive restaurants. There’s also a bunch of snacks, edible souvenirs, and an assortment of drink stalls dotting Ala Moana Center’s pathways, so quenching a sudden thirst or hunger pang won’t be difficult. Artwalk – If structures, sculptures and art are your thing, make it a point to tour the artwalk as you shop. These are beautiful pieces that have strong ties to the local culture and even history. Farmers’ Market – Ala Moana Center recently brought back their weekly farmers’ market if you’re looking for some fresh produce or local snacks. 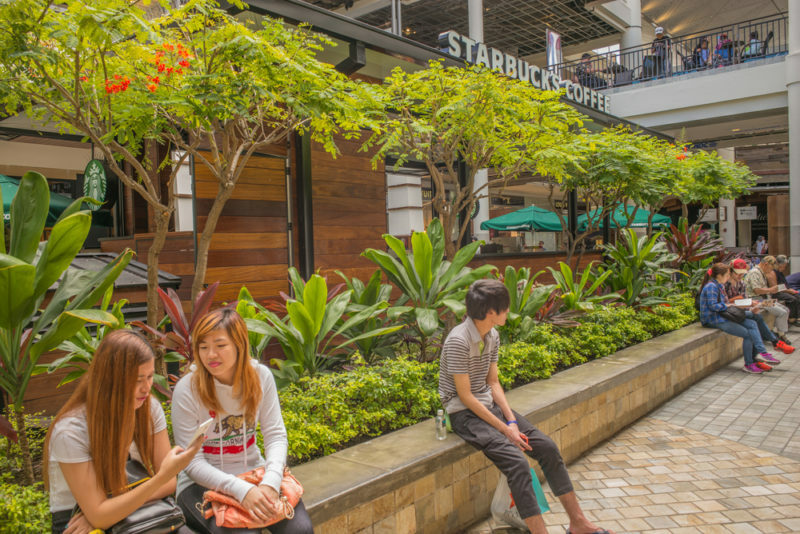 Rest and enjoy – The one thing that’s really awesome about Ala Moana Center is that there is plenty of seating all over the place. Say goodbye to wandering around looking for someplace to sit and rest your tired feet. Benches, grassy lawns, walls and even stairs that work as bleachers make it easy even for large groups to meet up comfortably. Check out Ala Moana Center’s event page to see what will be happening when you’re in town. 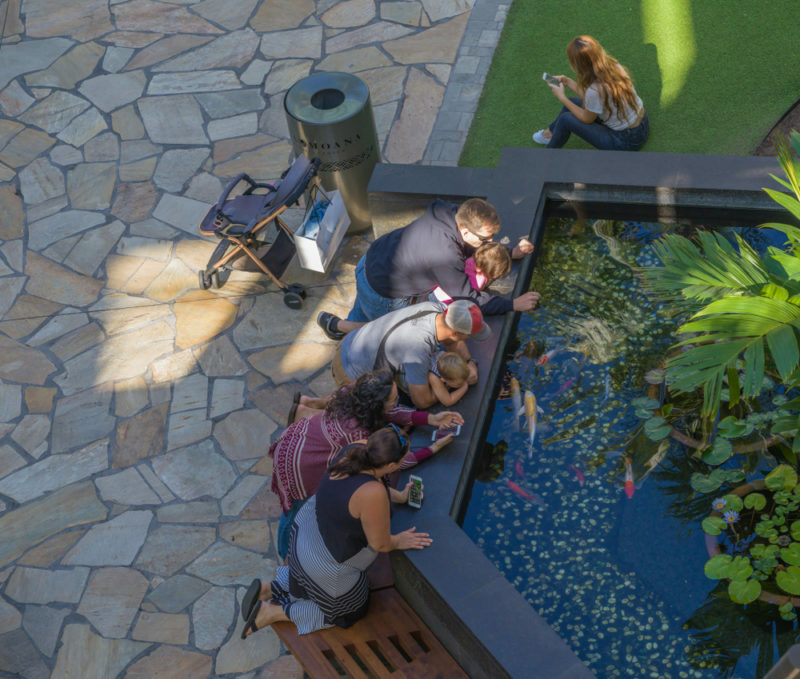 Koi ponds – The Ala Moana Center’s koi ponds are always a hit with the kids and I can attest to that – I remember looking forward to the koi ponds as a child and I could watch them for a reaaaally long time. They’re huge (to a kid), bob up and down and swim right in front of your face, which fascinate children. Luckey Climber – A 20-foot jungle gym for kids to climb, crawl, run and hang on to. This is one of the newer additions to Ala Moana Center and it’s proving to be very popular among Hawaii’s shortest visitors. Read more about this experience on Honolulu Family’s post. Besides what’s going on at Centerstage, Ala Moana Center is fantastic with holiday decorations and events. Stores and sales announcements, discount weekends and special holiday features are always going on so be sure to check their site for updates and more fun. Ala Moana Center isn’t just fashion and technology. There are plenty of stores that children will love to spend your money on. As Hawaii’s biggest mall, Ala Moana Center is pretty huge. While it’s always been crowded every time I’ve come, I’ve also never had a tough time finding parking (except for holiday season). There are multiple entrances on each side so getting onto Ala Moana Center’s premises is not a problem wherever you may be coming from. You can get to Ala Moana Center by public transportation or even walking if you’re in Waikiki. Many buses will pass through Waikiki and Ala Moana and even the trolley has a dedicated stop for Ala Moana Center. 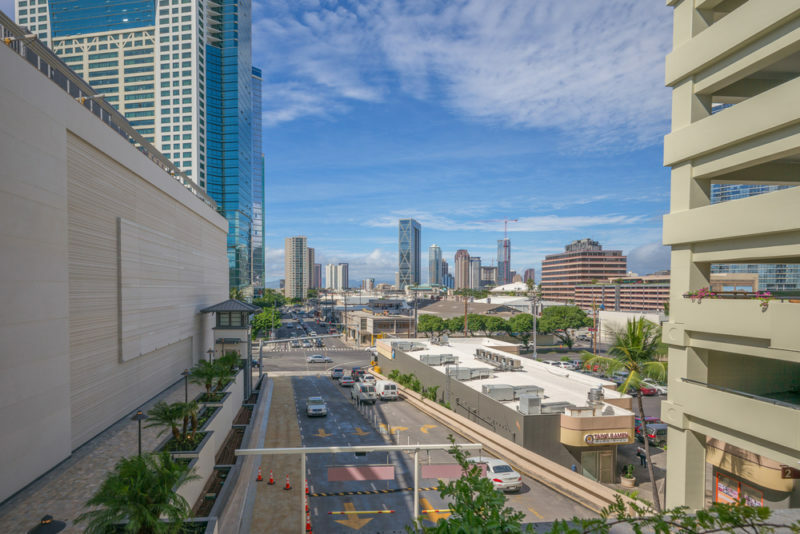 Check out the Visit Ala Moana Center’s page for current transportation info. Wondering about transportation in Hawaii and how you’ll get around? Read my post on Hawaii transportation to know when and what kind of transportation you should be using depending on your island, area and situation. Hopefully my tips will save you a few bucks and worries! Shopping at Ala Moana Center means venturing into stores like Prada, Gucci, and Neiman Marcus like a boss. You’ll see plenty of these top-brand stores with salespeople decked out in their finest suits and shiny shoes. But if you’re on the hunt for more affordable brands such as Swatch or the new H&M store, then you’re in luck. The Ala Moana Center stores are well-stocked with the latest fashions. Martin & MacArthur – Koa is the most expensive wood from Hawaii and treasured so much that the demand for koa products is much higher than it was in the old days. For a selection of beautiful koa products, Martin & MacArthur is a must. Crazy Shirts – At first glance, this may just look like a regular clothing store, but Crazy Shirts got it’s start in Hawaii and has been around since the 60’s! Their signature design are the Kliban cats who are always having fun Hawaiian style. Look for surfing cats, pineapple cats, cats eating spam musubi and even cats doing the hula. Check out their red dirt, pineapple and coconut-dyed shirts, too! Barnes & Noble – Believe it or not, there is still a bookstore in Ala Moana Center, complete with it’s own cafe, comfy chairs, kids korner and nice bathroom. It’s easy to spend a few hours here as you browse books and hide away in the corner once you’ve found a good one. Auana Quilts and Hawaiian Quilt Collection – Quilters will want to make a stop at either (or both) of these Hawaiian quilt stores. Experienced quilters know that Hawaiian quilts are very unique compared to other quilts around the world. What makes these so unique (and expensive) are their tropical designs and hand-sewn stitches. Both belong to the same company, but it’s still a good idea to visit both for different designs and selections. Microsoft vs. Apple – Both of these tech giant stores are what we would expect – clean, precise, and with every product imaginable laid out for hungry fingers to touch. But what’s really interesting to see are these two competitors right across from each other in Ala Moana Center. With just a few steps you can step into the other store to compare specs. Pandora – I’ve tried to keep top-brand stores out of this list, but Pandora must be noted because it’s the only Pandora where you can purchase a Hawaii exclusive charm for your Pandora bracelet. It’s a perfect memento for your Hawaii vacation. 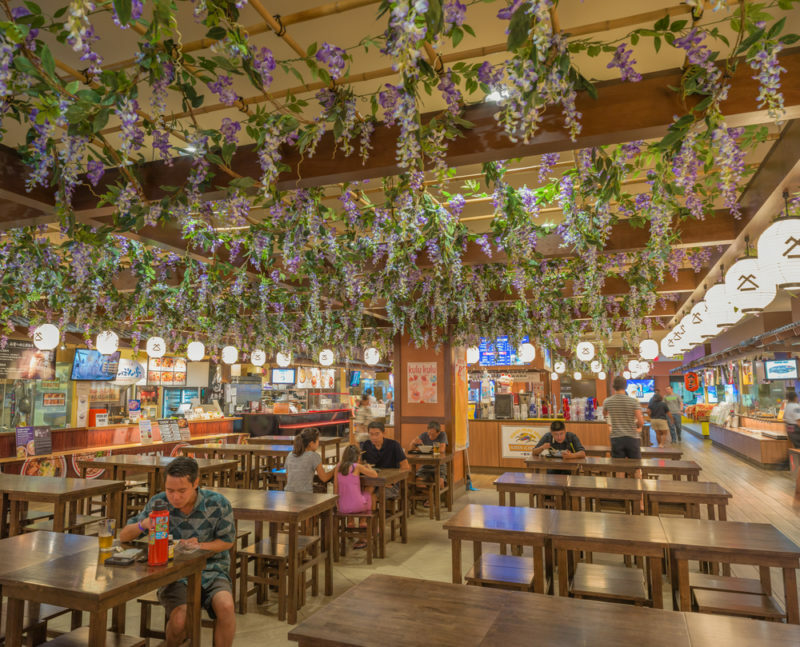 Makai Food Court – If you aren’t sure where or what to eat and aren’t looking for something fancy, the food court will be the best bet for you. It’s packed with vendors selling cultural dishes (Hawaiian, Mexican, Chinese, Japanese, American and Vietnamese to name a few) as well as local eats like Korean plate lunches and garlic shrimp plates. Japan Village Walk – Before the big Ala Moana Center renovation, Shirokiya referred to the hidden Japanese food court that locals and tourists flocked to. Now, it’s a whole lot bigger with plenty of seating, entertainment and Japanese/Asian cuisine that will make you feel like you’ve suddenly entered a new world. Be ready for colorful crepes packed with toppings, sizzling grills with teriyaki meat and the sound of hot metal spatulas as they toss yakisoba back and forth. The Lanai – I have a feeling that millennials will really like the Lanai at Ala Moana Center. It’s hip, modern and of course, delicious! This is another food court set up where you’ll have several food vendors to choose from with both indoor and outdoor seating options. Full-service restaurants – For those who want nice seating, servers and perhaps even an awesome view, you’ll find it at Ala Moana Center. Most of these can be found on the Hookipa Terrace on level 4. But my favorites are the hidden gems: Mariposa inside Neiman Marcus – terrific view! Vintage Cave has both a cafe and a club. While the cafe is more normally priced, the club prices may make you faint! But, there’s a reason this place has become worth it for foodies. GEN Korean BBQ is for those who love buffets and meat – keep that grill going! Snacks and drinks – You’ll find juices, smoothies, cookies, bakeries, shave ice and coffee shops all over Ala Moana Center so taking a break is easy. Get a head start and check out the Ala Moana Center’s online magazine. Ala Moana Beach and Magic Island are literally right across the street complete with bathrooms and showers. Hop in for an early morning swim (or watch the sunrise). Eggs ‘n’ Things is a big hit in Waikiki – there’s always a long line for those golden brown waffles and pancakes. But a lot of people don’t know that a new store opened up in Ala Moana Center! Wear sunscreen and comfortable shoes because you’ll be walking outside most of the time. Downtown Honolulu traffic will make it harder to enter/exit Ala Moana Center if you’re driving yourself. I suggest avoiding rush hour times to save you the hassle since they block off some of the turns from Kapiolani Boulevard. Wow! I love how you chose something so specific and detailed everything … very helpful!! Thanks! Ala Moana is a huge attraction here so it’s only natural I cover the shopping, right? Lol.